The children's Sunday school program at Salford is a lively, creative, and welcoming experience. 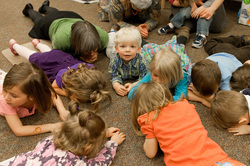 Children begin the hour of time together with singing. One singing group includes the preschoolers, and the second singing group includes children in kindergarten through grade 5. An offering is collected for special projects around the world at this time as well. Following music and singing, the children head to their classrooms for Bible stories and related activities. Teachers and students are always happy to welcome newcomers or one-time visitors! Middle School (6th-8th Grade) and High School students each have their own class taught by the youth pastor and sponsor team. Classes focus on Biblical understandings, sharing faith stories, and learning about Mennonite values and theology. Visitors are always welcome! Wise & Wonderful - This class consists of persons generally in their 80s and 90s, including men, women, single, and married. Each week we enjoy coffee, share joys and concerns, pray together, and study the Adult Bible Study lessons in a spirited discussion format. The class supports a number of local ministries with our weekly offerings. We meet in the Meeting Room behind the Welcome Center in the main lobby. 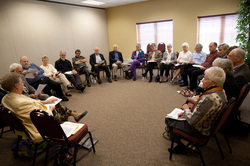 Ambassadors - This class, which meets in room 210-211 upstairs above the main lobby, consists mostly of persons in their 70's who engage in lively discussion, using the Adult Bible Study lessons under the leadership of a team of 4 members who rotate teaching. We enjoy gathering for breakfast once a month and support various ministries in the church. Reaching Out - This class meets in the south end of the Gathering Room above the main lobby and has stimulating discussion using the Adult Bible Study. This class is made up of persons who wish to study the Bible. Teaching responsibilities rotate among several class members. Sharing is an important part of the Sunday school hour. Seekers - This class of 35-60 year olds meets in room 205 upstairs above the main lobby. As their name suggests, they are seeking the way of Jesus as they delve into resources that help them become disciples of Christ. Friendship Class - Meeting in room 204 upstairs above the main lobby, this is a class of ladies aged 35-60 or so, who share their journeys together, support one another in prayer, and study resources that fill their spiritual needs. Gospel Herald - This class of all ages meets in the north end of the gathering room upstairs above the main lobby. We read and discuss articles from a biweekly magazine called "The Mennonite" which is produced by Mennonite Church USA. Other issues of high interest may be raised and discussed as well. Foundations - Meeting in three classrooms above the main lobby, room 207, room 206 and room 203, this class consists of folks from about 25-45. Leadership is shared by class members, and curriculum varies according to interest. Seats are always open for new persons or couples to join. Social activities are also enjoyed throughout the year. Hilltop - This class for uniquely gifted adults meets in room 11 downstairs under the sanctuary. Singing and rhythm instruments add a special dimension to the time together. Sojourners - This young adult class meets primarily during the summer months and over the Christmas break. It is made up primarily of college-age students. #SundaySchool - Twenty-somethings, young adults... whatever you want to call them, this is their class! #SundaySchool is #Awesome.